As fellow Studio member Greg Betza announced the other day, GDI issue 3 is in the mail and making the rounds. 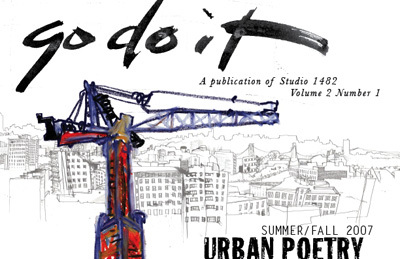 Go Do It is the periodical publication of Studio 1482; our chance of contributing on another level. This issue finds us getting our rythym in an editorial sense with the subtitled Urban Poetry issue, dedicated to the many aspects of what it is to be urban and the beauty of the urban landscape. Aside from my normal role of getting the magazine to print, I am honored to be featured on a few pages with some of my fellow Studio members. My contribution on the idea of the urban landscape comes from the point of view of the creator, the machine that built the skylines of America. 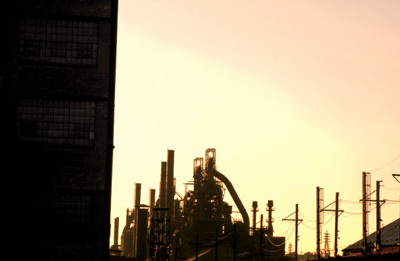 Part of a blue collar history most likely never to return, I pay homage in issue 3 to the old Bethlehem Steel site. A little sampling of a larger photo essay, I am happy to share these selections with our GDI audience and look forward to hearing from those who have received their copy. Go Do It is the promotional magazine of Studio 1482. It is distributed for free to industry leaders in the graphic and visual arts professions. Our mailing list is updated periodically depending on the topic and content of the current issue. To ensure your next copy of Go Do It please email us at info@gdimagazine.com with your name, company, title, mailing address, and email. All information is used solely for mailing purposes of Go Do It and is not shared with any outside parties.